Secret deals are made by the Batman and Ras Al Ghul. The ramifications of the aforesaid will be revealed, hopefully. Story - 3: The soap operatic feel was palpable this installment. Again, more characters are introduced, and only to laden the story with secrets and lies. Four issues in and one has to ask, "What is Injustice 2 about?" Besides the obvious cash-grab, what is the thrust of this series, this time? It's not Regime Superman versus the Batman, or the restoration of the world from a despotic regime. It's a dealer displaying cards long after the player has hit 21. There's little here and after a decent enough start. Hopefully, things pick up. Art - 3: What would Injustice look like without the deliberately standard fare? That is a question I would love to have answered. 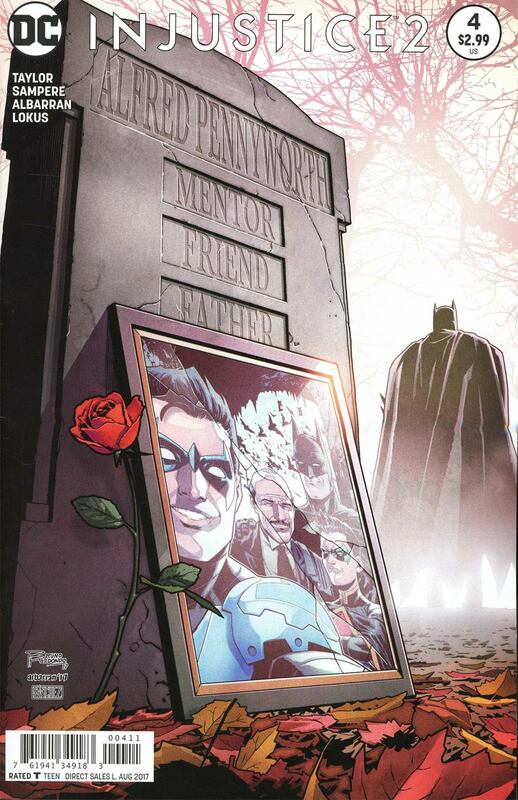 Cover Art - 3: A lovely tombstone.